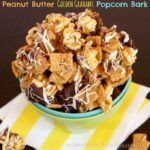 With only six ingredients, this easy no-bake snack mix recipe is irresistible with its sweet and nutty flavors. 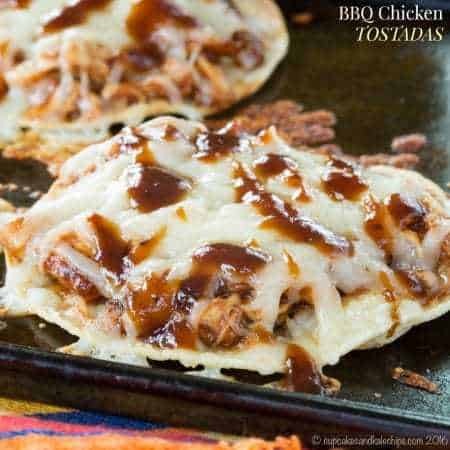 Perfect for party munchies, game day snacks, or even holiday gifts. 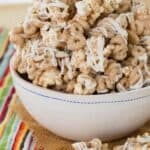 White chocolate popcorn snack mix becomes even more munch-worthy and irresistible when you add the delicious taste of banana and winter spices from Banana Nut Cheerios to make this gluten-free cereal snack. With the sweet and nutty flavors everyone loves, Banana Nut Cheerios White Chocolate Popcorn Snack Mix is perfect for game day snacking or holiday gifts! 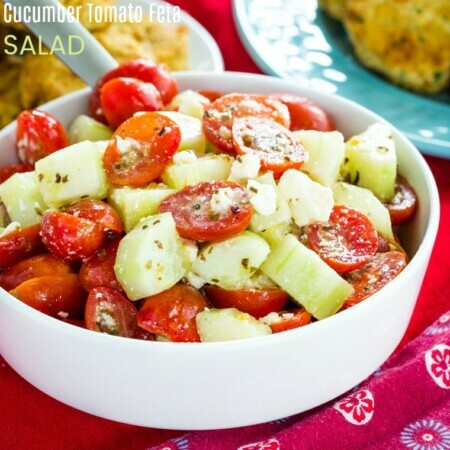 Disclaimer: This recipe was developed through a sponsored partnership with Cheerios to introduce Banana Nut Cheerios. As always, all opinions are my own. The Hubby and I love watching sports. I mean, we don’t spend our entire weekend sitting on the couch, and we aren’t glued to the television for each and every pitch, pass, base hit, or penalty. And let’s be real, you probably can’t even call me a real “baseball fan” because I only watch my team. The Hubby will watch his share of college football. And while we do pretty much plan our fall weekends around his alma mater’s games, other games usually serve as background noise while we do things around the house on Saturday. We are trying to make it a family thing, but the boys just aren’t into watching baseball and football yet. They know the games get mommy and daddy excited, so they’ll come sit with us when we have the TV on, but it lasts about one set of downs or a half inning before they get fidgety and decide their toys are way more exciting. That is, unless the game starts in the evening, and watching means getting to stay up past their bedtime. Then they are all into it, sitting in the couch, cheering for our teams, pretending they actually know and care what is going on. We won’t mention how many times they have cheered for the “wrong” team. Banana Nut Cheerios White Chocolate Popcorn Snack Mix is the snack mix recipe you need for game day munching, party nibbles, or even edible gifts for the holidays! This easy snack mix recipe has just six ingredients, and looks as good as it tastes. 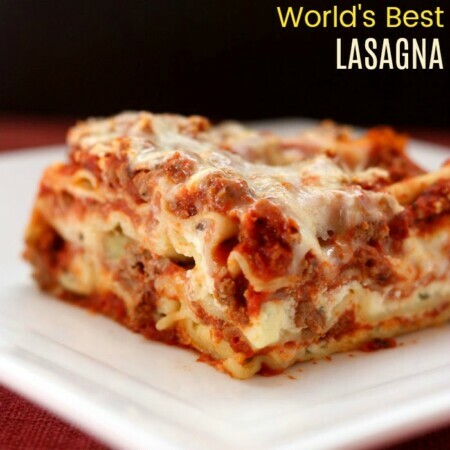 The hardest part will be keeping your hands out of the bowl. With a melty mixture of white chocolate and almond butter coating every nook and cranny, you get plenty of sweet and nutty flavor. Fluffy popcorn balances the fruity crunch of banana chips scattered throughout, and a drizzle of white chocolate with a sprinkling of sliced almonds not only makes it look pretty, but gives you a preview of the deliciousness you are about to experience. 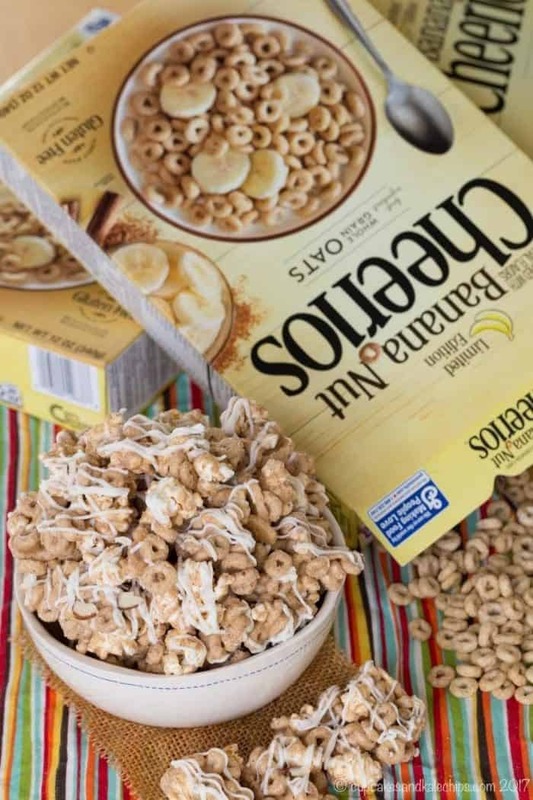 Yes, Cheerios is bringing back Banana Nut Cheerios, and it will be available in stores nationwide from mid-November to December. Those little O’s have big banana flavor from real banana puree, plus all the warmth of your favorite winter spices including real cinnamon. When things get busy during the holiday season, you can be reminded of your favorite home baked treats while still enjoying a wholesome breakfast or snack. 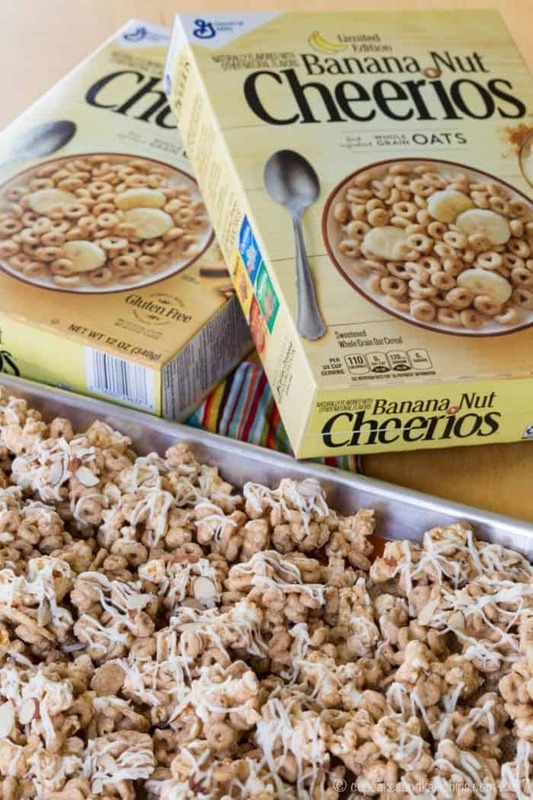 Just like my family, yours will love pouring a bowl of Banana Nut Cheerios with milk in the morning, or grabbing a handful for a quick afternoon snack. 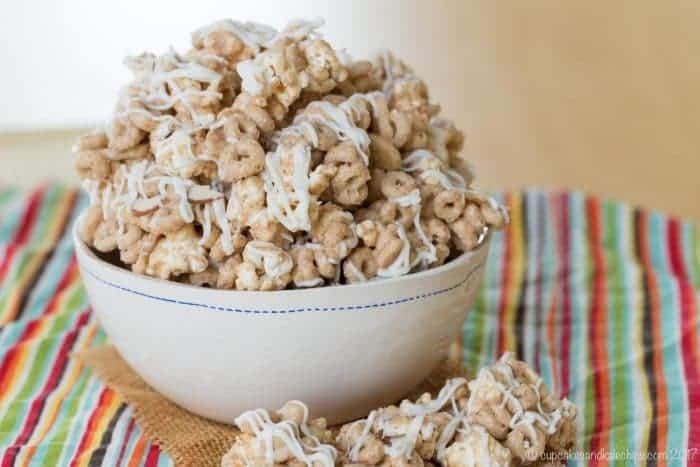 And they add incredible taste to your favorite cereal recipes like this Banana Nut Cheerios White Chocolate Popcorn Snack Mix recipe! I also found some recipes from my friends that would be awesome if you swapped in Banana Nut Cheerios. 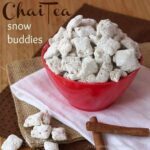 They will be a perfect match for these Banana Marshmallow Cereal Treats from Brown-Eyed Baker. 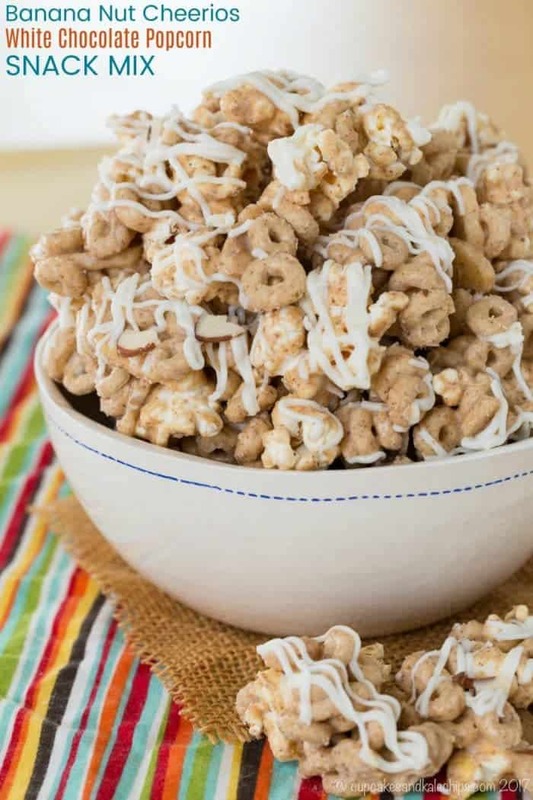 Add some banana flavor to these 3-Ingredient Honey Almond Cereal Treats from Happy Food Healthy Life. Or add that banana nut goodness to Soft Baked Cheerio Monster Cookies from Noble Pig. 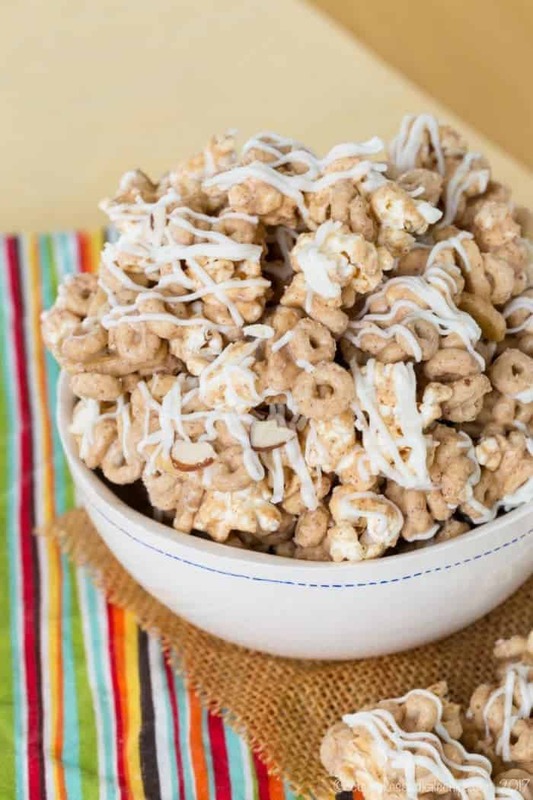 Bet you can’t wait to make this Banana Nut Cheerios White Chocolate Popcorn Snack Mix recipe! Line a large baking sheet with wax paper or a silicone baking sheet. In a large bowl, combine the Banana Nut Cheerios, popcorn, and banana chips. Set aside 1/2 cup of the white chocolate chips, and place the rest in a small bowl with the almond butter. Set the bowl over a pot of simmering water and stir until melted and smooth (see Note). Pour the white chocolate and almond butter mixture over the cereal mixture, and toss with a spatula until evenly coated. 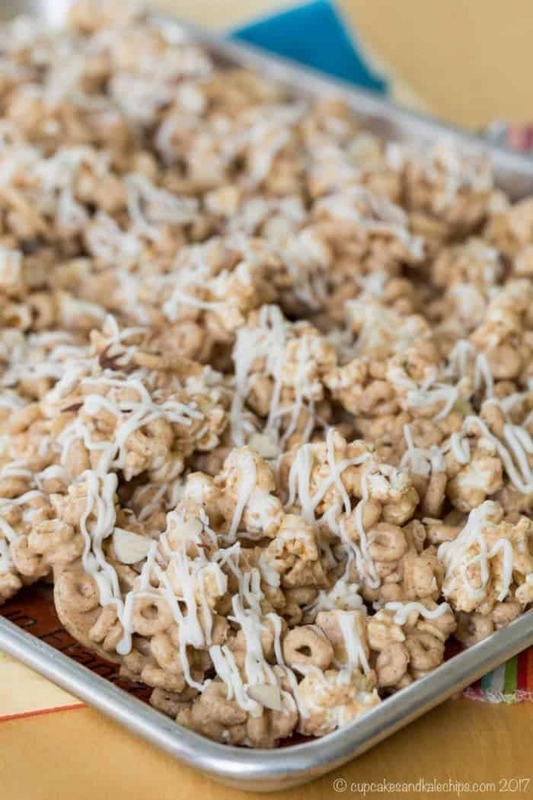 Spread the coated cereal mixture on the prepared baking sheet in a single layer and allow to cool slightly. While it is cooling, melt the remaining 1/2 cup white chocolate chips in a bowl over a simmering pot of water or in the microwave (see Note), then drizzle over the cereal mixture on the sheet. You can transfer the chocolate to a plastic bag and cut off the very tip to make it easier to do a thin drizzle. Sprinkle the sliced almonds over the top, tapping down the pan or pressing them in as needed so they stick to the chocolate. 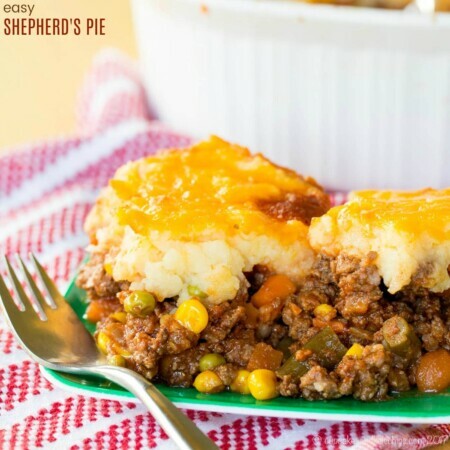 Allow to cool and harden for several hours at room temperature before breaking into pieces and storing in an airtight container. You can also melt the white chocolate in the microwave at 50% power, stirring every 15-30 seconds until melted, but it does tend to be more smooth when melted on the stove. 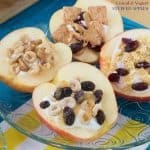 We LOVE Cherrios and I bet this is a great way to enjoy them! Love the addition of banana chips – so smart! My daughter will love this! She has been requesting new snacks.